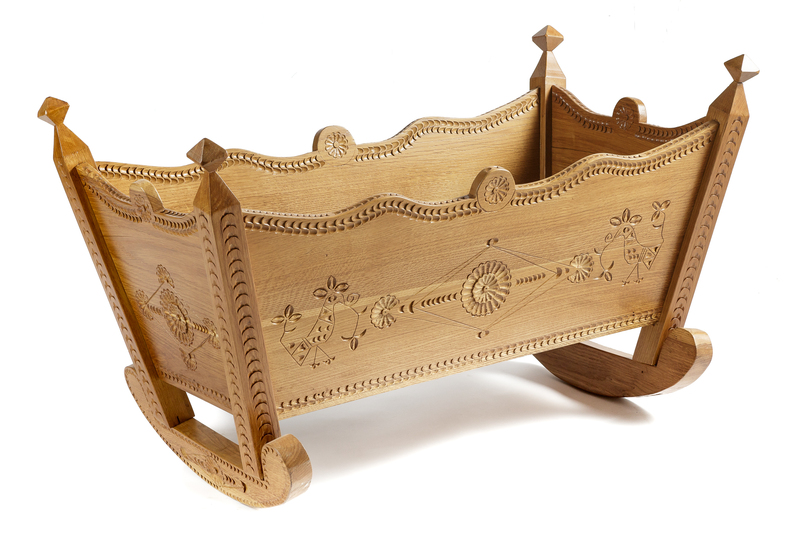 This fine rocking cradle with an elegant carved decoration masterly reinterprets the local craft tradition. 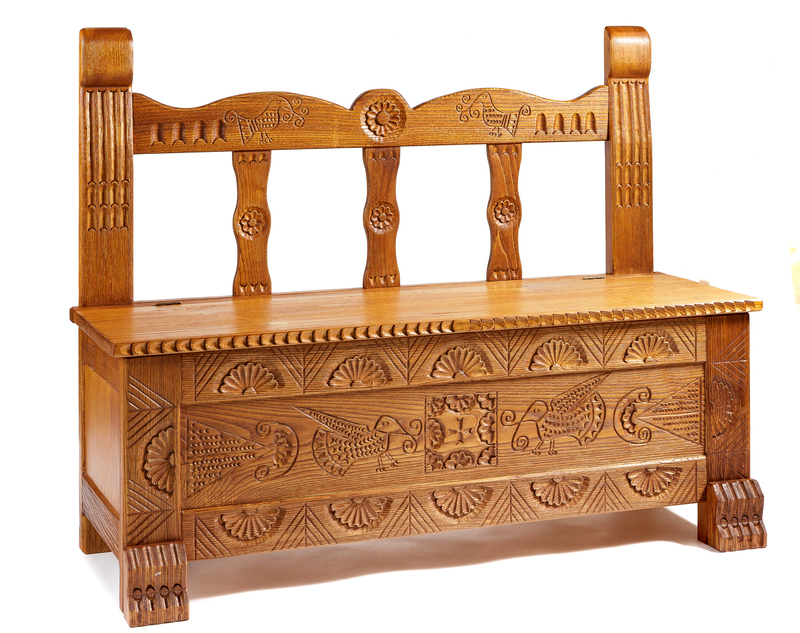 This traditional bench in Sardinian chestnut wood is masterly handcrafted and features accurate carved decorations. The refined motif of sa mustra, which adorns the central panel, is taken from an ancient design, reproduced with the utmost aesthetic fidelity. 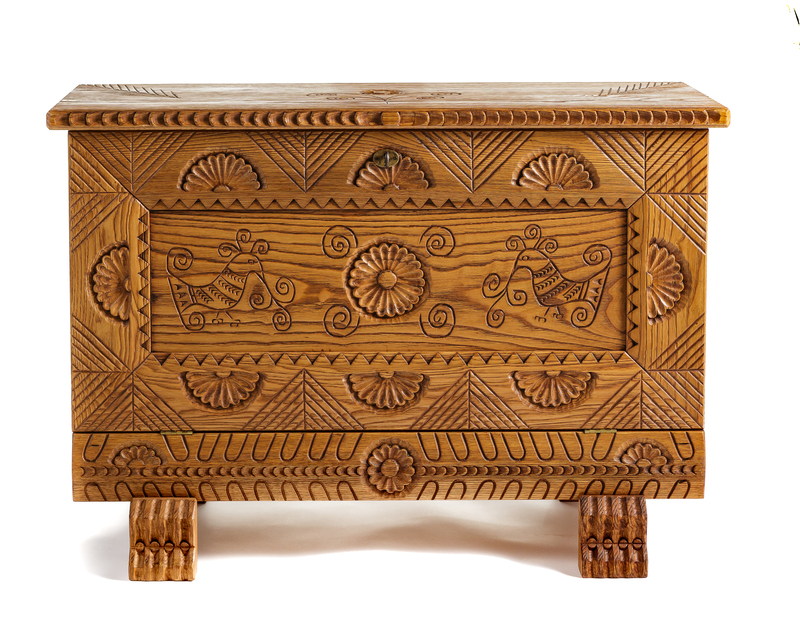 This wedding chest typical of the tradition of Barbagia and Mandrolisai is skilfully crafted reproducing the classical aesthetics in the refined carved decorations. 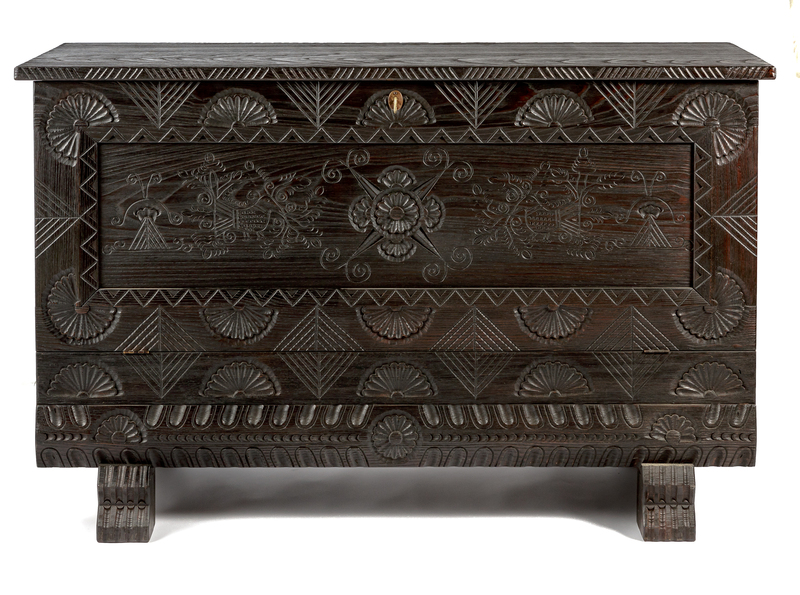 This traditional chestnut wood chest with carved decoration is realised in a smaller version and is characterised by the refined composition of the decorations. Domenico Cugusi’s traditional furniture stands out for the technical expertise and refined aesthetic impact that give the artefacts authenticity. A skilled carpenter from Gavoi, a village in the central region of Sardinia called Barbagia, Domenico started his apprenticeship at the early age of thirteen in a carpenter’s shop in his village, where he learned the traditional carpentry techniques. Driven by personal interest, he furthered his skills by investigating the techniques of traditional furniture, characterised by the distinctive carving technique. Thus, he acquired an invaluable rich collection of designs and decorations taken directly from the ancient artefacts encountered along his professional path, also thanks to commissioned restoration work. Traditional chests, benches, sideboards and cradles made of chestnut wood with the typical carvings form part of Domenico’s production made out of passion and characterised by technical expertise and finishing touches that lend its artefacts an authentic appearance, such as that of antique artefacts. He works in his carpenter’s shop in Gavoi, where he realises a wide range of products, which he successfully promotes at local and national exhibitions and fairs of the crafts sector. 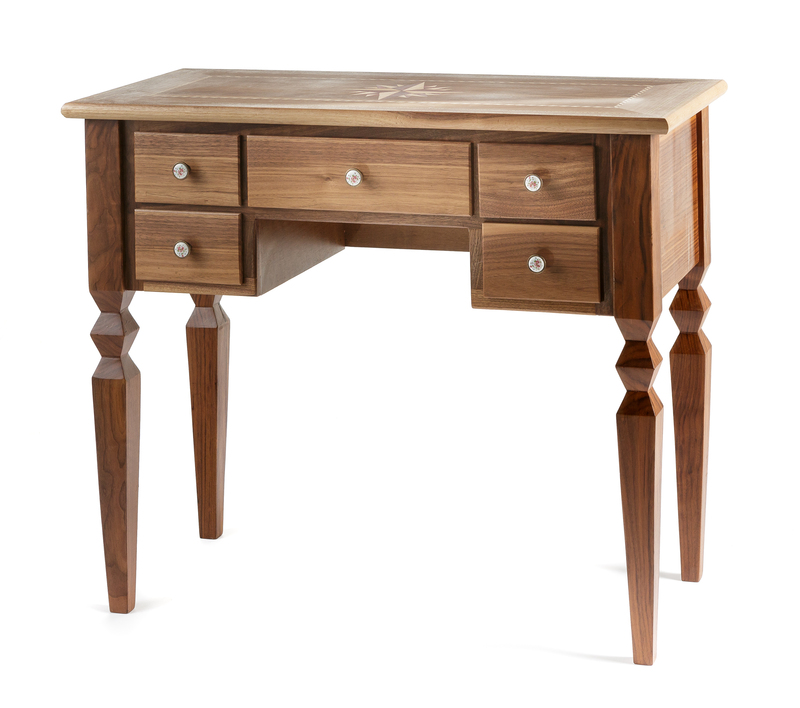 The production of traditional furniture by Domenico Cugusi features technical and aesthetic fidelity that lend his creations authenticity, also thanks to the use of local woods such as chestnut, walnut and juniper. In addition to this production made with true passion, Domenico designs and crafts furniture in different styles and with engraved and carved decorations, that can be made to order for every room of the house. His carpenter’s shop carries out all kinds of woodwork for houses: door and window frames, stairs and structural and decorative details. Fine decorative carving and inlay techniques, performed exclusively by hand, characterise the production of traditional artistic handicrafts by Domenico Cugusi’s carpenter’s shop. All artisanal techniques for the creation of made to order customised items of furniture for all the rooms of the house are employed.